My friend’s beautiful daughter turned 6 years old over the weekend. I asked my friend if I could bake a small cake for her. 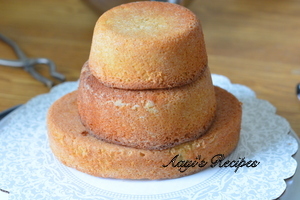 Initially I thought of baking just a simple cake. Then last week, I thought I would decorate it into a Princess. I had seen that she enjoys Frozen movie. 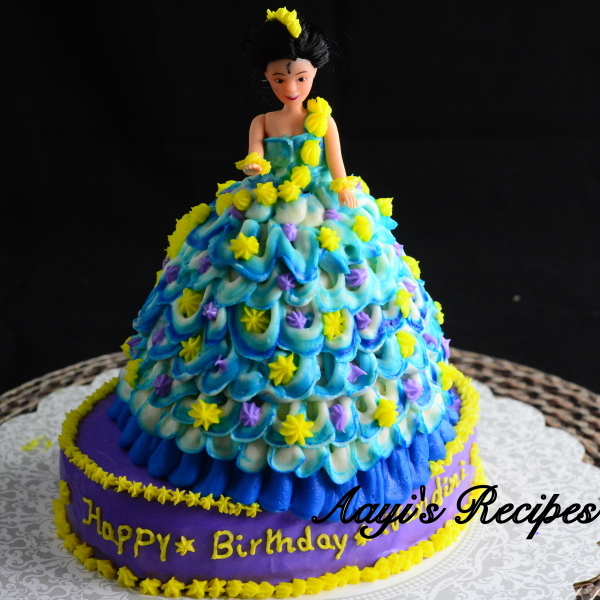 Then I found some Princess cakes onlines, with blue dress which looked so beautiful. So I decided to go with blue dress. The blue Princess cake, I think it came out very well. 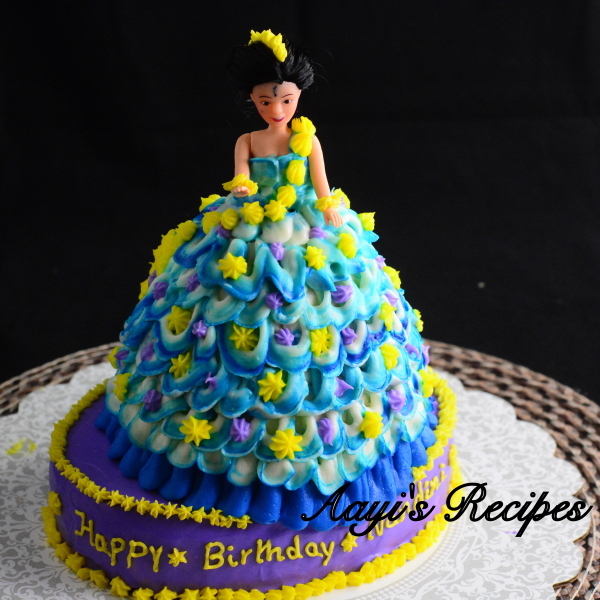 Someone asked me which princess it was based on, since it had the bindi, I really did not base it on any princess characters, it was just that I really wanted to make it a light blue cake. I added the bright yellow flowers for the extra pop of colors. The cake was Simple egg cake. The frosting was creamcheese-buttercream frosting. The doll is plastic. It was a 4 inch doll. 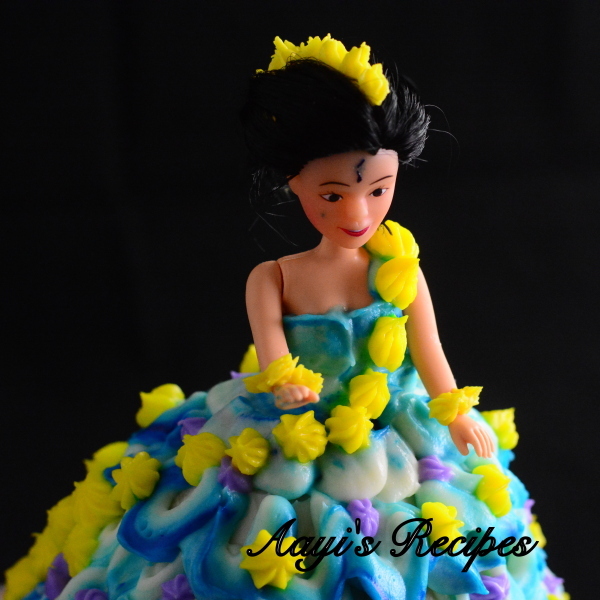 Since the doll was kind of small, I thought of keeping it on a oval shaped cake. 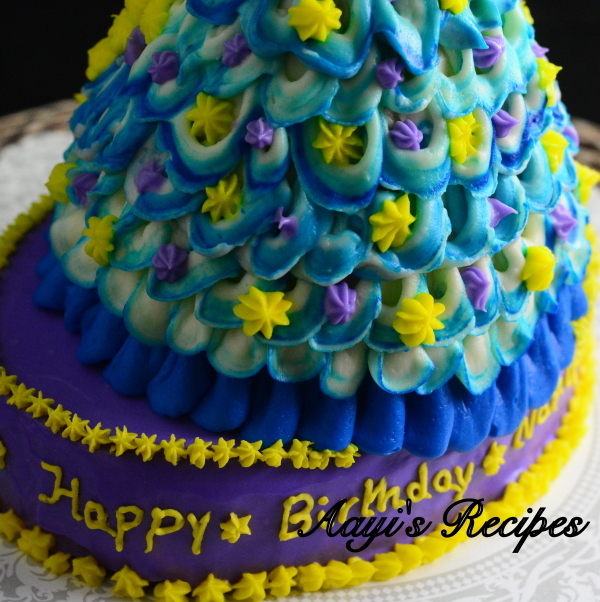 It gave the much needed height to the cake. Before frosting the cake, I cut each piece horizontally and applied a thick layer of frosting in between to give extra taste to the cake. I have seen many Princess cakes where a dressed doll is used as the insert. That may be something I will keep in mind for future. For now, I really enjoyed making the whole dress. Shilpa, lovely decoration. Admire your patience in doing such intricate work – must have taken hours to do it. Don’t know how you manage to spare time to do the cake, blog, etc. with having little ones. Great job by you and your mom with sharing Konkani recipes! It must be working now, can you please check. Hi shilpa, it seems to be working now.thanks!! 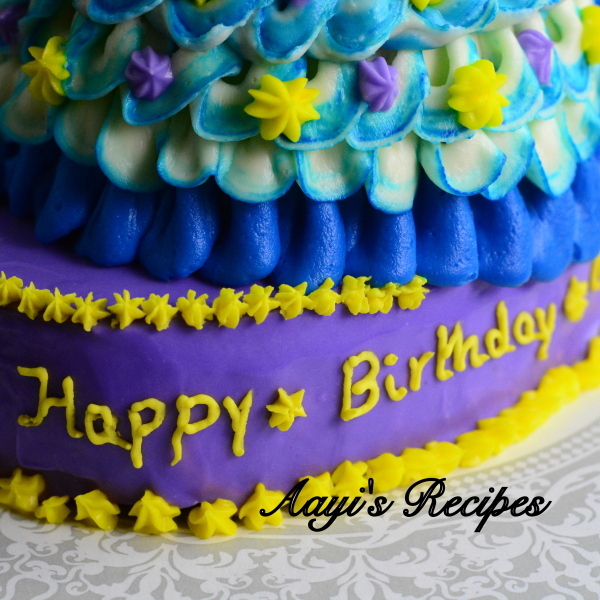 Very nice Princess cake with Blue and Yellow. How did you do the blue and white frosting curls together. Looks a neat idea! Shilpa Superb work!! Nicely explained step by step.